Exit Interview is a behind-the-scenes look at Westin's tenure and the major news that marked it. He takes us inside the chaos of the newsroom—alongside major players such as Peter Jennings, Barbara Walters, Diane Sawyer, and Bob Woodruff—where what looks clear and certain from the outside is often mired in conflict and urgency. Neither an apologia nor a critique, the book charts the ups and downs of fourteen formative years in network news, addressing basic questions about how our news is reported, from the point of view of someone who was there. With milestones from the recent past, Westin explores the uncertainty inherent in his job, and its central question: Is it possible for journalists to be both good at their jobs and people of good moral character? 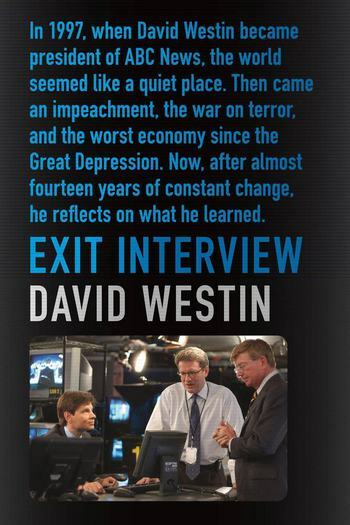 David Westin was president of ABC News from March 6, 1997, to December 3, 2010. He lives in Bronxville, New York.